This engineering sample ONLY supports assembled or DIY desktop computers and servers! Intel Xeon E5-2683 v4 ES QHUY 2GHz 16C LGA2011-3 Compatible X99 i7-6950X. When possible, items from multiple orders will be combined into the same package. There is a high possibility of compatibility issues using this ES CPU (such as boot failure) onto branded computers or branded servers, because generally MOST BIOS of the branded servers and branded computers do NOT contain the Specific Microcode to support the engineering sample (ES) version of E5-2600 (v1, v2, v3 and v4) series CPUs. The following is a Non-exclusive list of compatible products. Compatible Servers & Workstations: Dell: Precision T5810 (BIOS A12 or above) Dell: T7810 (BIOS A12 or above) Dell: T7910 (BIOS A12 or above) Dell: PowerEdge T440 Server Compatible Motherboards: Supermicro: X10S series (all models with BIOS R2.0 or above, except X10SRW-F) Supermicro: X10D series (all models with BIOS R2.0 or above, except X10DRT-L, X10DRW-I) Supermicro: C7X99-OCE (BIOS R2.0 or above) Tyan: S562 series (BIOS V2.00 or above) Tyan: S707 series (BIOS V2.00 or above) Tyan: S708 series (BIOS V2.00 or above) Asus: Z10PE-D8 WS (BIOS 3204 or above) Asus: Z10PE-D16 WS (BIOS 3204 or above) Asus: Z10PA-U8 (BIOS 3202 or above) Asus: Z10PA-D8 (BIOS 3107 or above) Asus: Z10PC-D8 (BIOS 3104 or above) Asus: Z10PE-D16 (BIOS 3104 or above) Asus: Z10PR-D16 (BIOS 3104 or above) ASRock: X99 series (all models with BIOS 3.00 or above or above) ASRock: EPC612 series (all models with BIOS 2.10 or above) ASRock: FH-C612NM (BIOS 1.10 or above) MSI: X99 Godlike Gaming Carbon (BIOS 2.4 or above) MSI: X99 Godlike Gaming (BIOS 1.6 or above) MSI: X99A XPower Gaming Titanium MSI: X99A Gaming Pro Carbon (BIOS 1.1 or above) MSI: X99A Gaming 9 ACK (BIOS 3.4 or above) MSI: X99S Gaming 9 ACK (BIOS 2.8 or above) MSI: X99S Gaming 9 AC BIOS 1. B or above MSI: X99A XPower AC BIOS A. 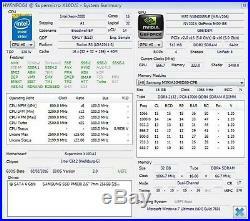 5 or above MSI: X99S XPower AC BIOS 1. B or above MSI: X99A/S Gaming 7 BIOS H.
E or above MSI: X99A/S MPower BIOS M. A or above MSI: X99A/S SLI Krait Edition BIOS N. 7 or above MSI: X99A/S SLI Plus BIOS 1. C or above MSI: X99A Raider BIOS P. 4 or above Note: A BIOS upgrade may be necessary for motherboards manufactured prior to the introduction of Xeon E5-2600 v4 series CPUs series. Note: A firmware upgrade of an onboard chip other than BIOS may be necessary for some Asus Z10 motherboards to enable dual-processor support. INCOMPATIBLE OR UNSTABLE Servers & Workstations: Dell Precision Rack Workstation, Dell PowerEdge Rack Servers: support v4 series CPUs with A1/L0/M0/R0 stepping, v4 series CPUs QS version or retail version/ OEM version CPUs only. HP servers and workstations: support v4 series CPUs with M0/R0 stepping, v4 series CPUs QS version or retail version/ OEM version CPUs only. HPE Proliant DL380 Gen9 Servers Not Supported! HPE ProLiant DL120 Gen9 Servers Not Supported! HP Z840 Workstation Not Supported! INCOMPATIBLE OR UNSTABLE Motherboards: Asus X99 Express Chipset motherboards (Only supports assembled or DIY desktop computers): some but not all stuck on Q-Code 19 after reboot; They support v4 series CPUs with M0/R0 stepping, v4 series CPUs QS version or retail version/ OEM version CPUs only. Gigabyte X99 Express Chipset motherboards (Only supports assembled or DIY desktop computers, with BIOS F22 or above): ALL BOOT LOOP; They support v4 series CPUs with M0/R0 stepping, v4 series CPUs QS version or retail version/ OEM version CPUs only. The CPU-Z screenshots shows the Stepping, the Number of CPU cores, level 1 cache , level 2 cache and level 3 cache , Max TDP, multiplier, and the Core speed (the maximum frequency) which is the maximum ALL cores frequency at which the processor is capable of operating using Intel® Turbo Boost Technology (Turbo Boost all of the cores simultaneously). All of the engineering sample (ES) version of E5-2600 series CPUs are NOT UNLOCKED but will be able to turbo up ALL cores (Turbo Boost all of the cores simultaneously) to the maximum frequency which the CPU-Z screenshots uploaded shows. 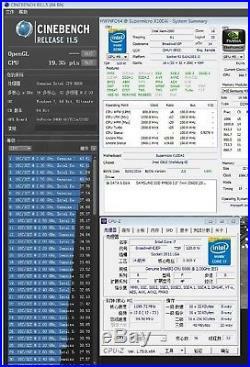 Intel's definition of Max Turbo Frequency in Intel's official site is Max turbo frequency is the maximum SINGLE core frequency at which the processor is capable of operating using Intel® Turbo Boost Technology.
" Therefore, the meaning of "Max Turbo Frequency which shows. On intel's official site. Is different from the meaning of the Core speed (Turbo Boost all of the cores simultaneously) shows in the CPU-Z screenshots uploaded on this page. 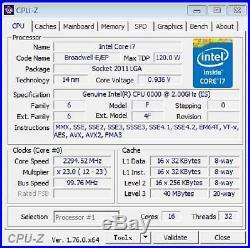 About Intel Turbo Boost, the Calculation of Intel Turbo Boost shows an Example on the middle of this page of this link. About C6/C7 low-power states problem(If you are experiencing stability problems or worse, the system shut down completely) Because most power supplies do NOT support Haswell's C6/C7 low-power states, so If you are experiencing stability problems or worse, the system shut down completely, please disable C6/C7 power states, which will not affect the performance and will just affect the low-power sleep states. Read more According to an Intel document viewed by the gang at The Tech Report, Haswells C6/C7 states requires a minimum load of 0.05 amps on the 12V2 line. Power supplies that are older or budget models simply arent capable of delivering such a small amount of juice. As a result, users with incompatible power supplies may experience stability problems or worse, the system may shut down completely if the power supply unit (PSU)'s under- or over-voltage protection kicks in. About Intel Turbo Boost VS Overclocking In one simple word it is a dynamic overclocking rather than a static overclocking. Because of the item is an ES (engineering sample) version CPU, for detailed specifications, Intel has not yet announced. Please refer to the OEM or retail version of the detailed specifications and the test screenshots of the CPU-Z release (ES detailed specifications for individual products may differ from the OEM or retail version). General information Type CPU / Microprocessor Market segment Server Family Intel Xeon E5-2600 v4 Model number E5-2683 v4 CPU part numbers CM8066002023604 is an OEM/tray microprocessor BX80660E52683V4 is a boxed microprocessor. This ES CPU frequency is 2000 MHz Core speed (Turbo Boost all of the cores simultaneously). Intel Secure Key, vPro technology and OS Guard. The item "Intel Xeon E5-2683 v4 ES QHUY 2GHz 16C LGA2011-3 Compatible X99 i7-6950X" is in sale since Thursday, August 30, 2018. This item is in the category "Computers/Tablets & Networking\Computer Components & Parts\CPUs/Processors". The seller is "icomputer_parts_international" and is located in Yokohama, Kanagawa. This item can be shipped worldwide.